Anchorage municipal offices are located at 632 West 6th Avenue, Anchorage, AK 99501; phone: 907-343-4311. Photo: Leopold David House, ca. 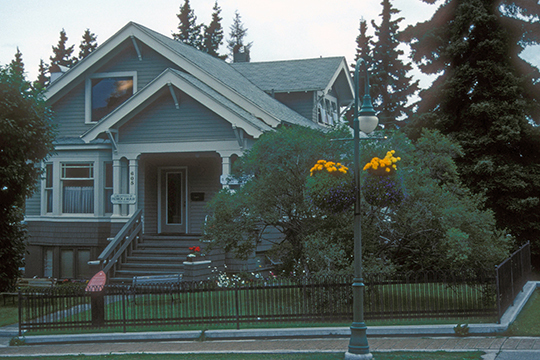 1917, 605 West 2nd Avenue, Anchorage, AK. David was the first mayor of the City of Anchorage. Listed on the National Register of Historic Places in 1986. Photographed by User:Jerrye & Roy Klotz MD (own work), 2008, [cc-by-3.0 (http://creativecommons.org/licenses/by/3.0)], via Wikimedia Commons, accessed January, 2014. The heart of the City of Anchorage is referred to as Anchorage Bowl. The earliest white people arriving in the area were Russian fur traders and missionaries. They were later followed by gold prospectors and traders passing through on their way to the gold fields. Some stayed to prospect the area, resulting in a few mining camps and small settlements along Turnagain Arm, most notably Girdwood. However, Anchorage did not come into being until the federal government decided to build a railroad from the tidewater community of Seward to the interior gold mining community of Fairbanks. Anchorage was founded when the government established the field headquarters for the construction of the Alaska Railroad at Ship Creek in 1914. Shortly thereafter, a tent city was set up along the shores of the creek by people seeking work on the railroad or business opportunities associated with it. The following year a townsite auction of 600 lots established the downtown grid pattern that is still in place today. Soon after, in 1920, Anchorage incorporated as a city. During World War II, Anchorage's strategic location made it well-positioned for the construction of defense support facilities serving the North Pacific. This advantage resulted n the building of Elmendorf Air Force Base and Fort Richardson Army Post. During the same period, construction of the Glenn and Alaska Highways gave Anchorage an overland link through Canada to the Lower 48. Anchorage's strategic location continued to play a valuable role during the conflicts in Korea and the rest of the Cold War era. Civil air facilities — first Merrill Field and Lake Hood, and later Anchorage International Airport—played an extraordinary role in the early development of both Anchorage and Alaska as a whole. Anchorage's airports consolidated the community's role as Alaska's premier center for intra-state and inter-state air travel and commerce. Municipality of Anchorage, Anchorage 2020: Anchorage Bowl Comprehensive Plan, 2001, www.muni.org, accessed January, 2014.